If you email an Adobe Illustrator file of your imprint (eps, ai, or vector file saved as a pdf), there is no extra charge. If the camera ready digital art work is not available there is a $30 charge to create it and you should email samples of the desired imprint (jpg, bmp, tif). There is no charge if your imprint is only text (no graphics), just email a copy and include font names if known. 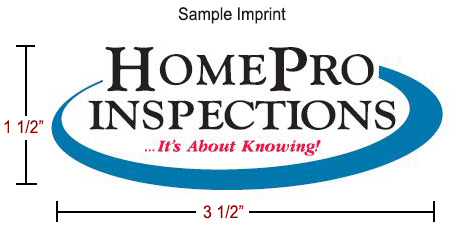 The maximum imprint width is 3 1/2" and the ideal height is 1 1/2". The maximum imprint height is 2" but the top part of the imprint may become less visible as people walk up to the door. We can usually adjust your art work to fit this area.